One reason why my models seldom look stupid in gun photos is that they are trained. Some show up with their own sidearms, others get training and help with getting equipped in the course of working with me. The Galco holster above belongs to one of my favorite models. She’s also been to an Appleseed shoot. It’s not surprising that she looks competent when handling firearms. 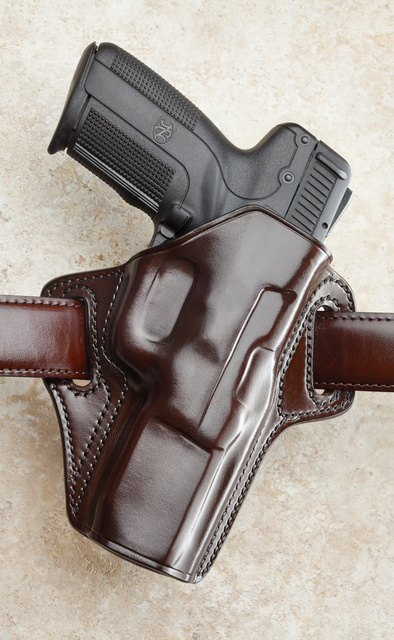 This entry was posted in holster, pistol and tagged 5.7x28, leather. Bookmark the permalink. Converting the world of fashion, one model at a time. What I’d really love to see is one of the reality TV fashion design shows do a series where each outfit had to conceal a handgun. Heads exploding on both left and right coasts. I’ve had the honor of meeting some of Oleg’s models & helping to train a couple. The noobs learned fast,were fun to work with,& several commented on being grateful to learn how to handle guns safely.All the ones I’ve met complimented Oleg on his patience,friendliness & professionalism. All were ladies. The ones who furnished their own guns kn0w their stuff & are NOT ladies you want shooting at you!